In horse artillery units everyone in the gun crews rides into battle: drivers ride the lead horses in teams, while gun crews sit on the gun limbers. 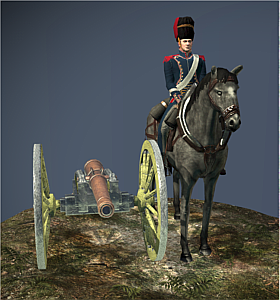 The Artillerie a Cheval represent a good balance between speed of movement and firepower. The crews are highly experienced and disciplined, and their intimate knowledge of the guns enables them to deliver accurate, devastating shots at long range. Historically, these men and their cannons were part of Napoleon’s Imperial Guard, and held in the highest regard by the emperor. Admittance to the Imperial Guard was extremely tough and, because only the very experienced or very good gained entry, the Guard could boast of the very best gunners in Europe. The horse artillery division was the elite within the elite, and got the best of everything. When the supply of suitable horses ran low in 1815, Napoleon ordered his Horse Grenadiers to give up their mounts to be draft animals for his beloved horse artillery.